Earlier this year, President Goodluck Jonathan signed into law the ‘Minimum Wage Act’, to pave the way for the implementation of NGN 18, 000 wage for Nigerian workers. The signing of the Act followed earlier agitation by organized labour, which argued that the previous minimum wage was insufficient to cater for workers’ basic needs in the face of adverse economic conditions and persistent high rates of inflation. However, since the President signed the Act, issues have cropped up regarding its implementation. Specifically, some State governors have said that due to lack of resources, they are unable to implement the new national wage in their States; leading to workers in these states embarking on strike action. 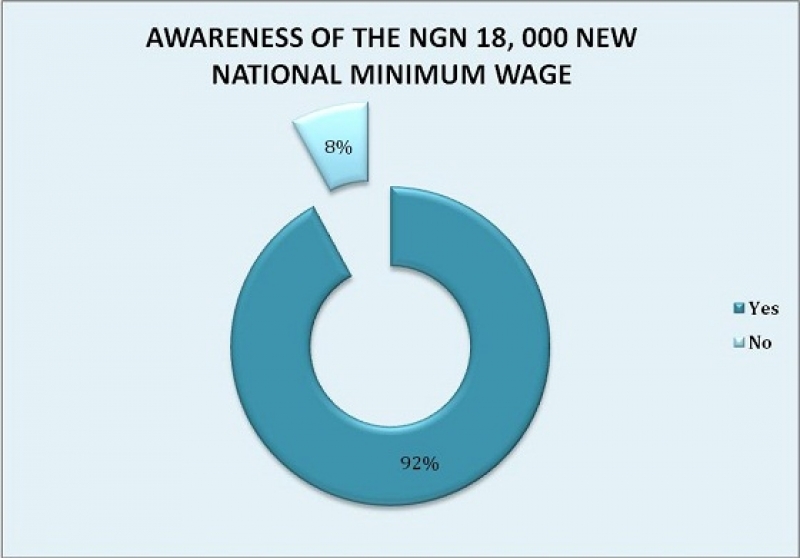 In a recent survey conducted by NOI Polls, respondents were asked if they were aware of the issues surrounding the adoption of the NGN 18,000 national minimum wage. 92% of respondents said they were aware while 8% said they are not aware. 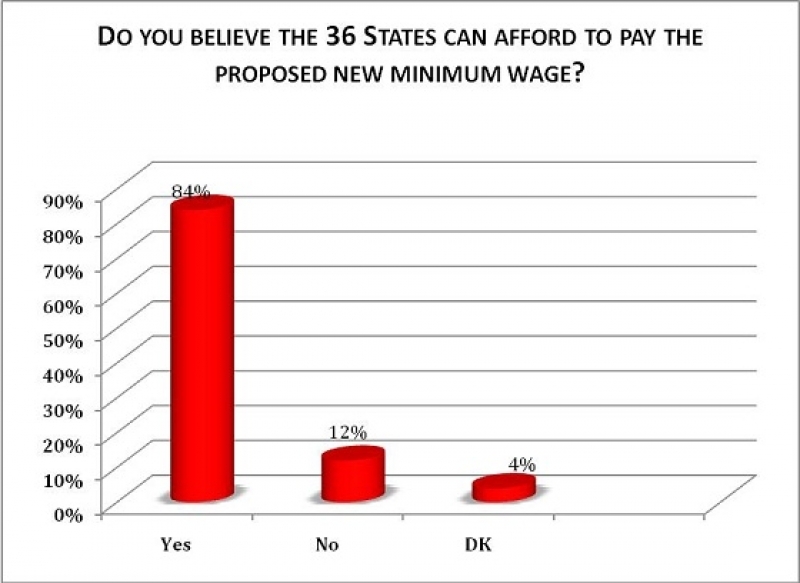 When asked the question ‘In your opinion, do you believe that the 36 states can afford to pay the proposed new minimum wage?’ Over 8 in 10 (84%) respondents answered ‘Yes’, while 12% responded ‘No’. 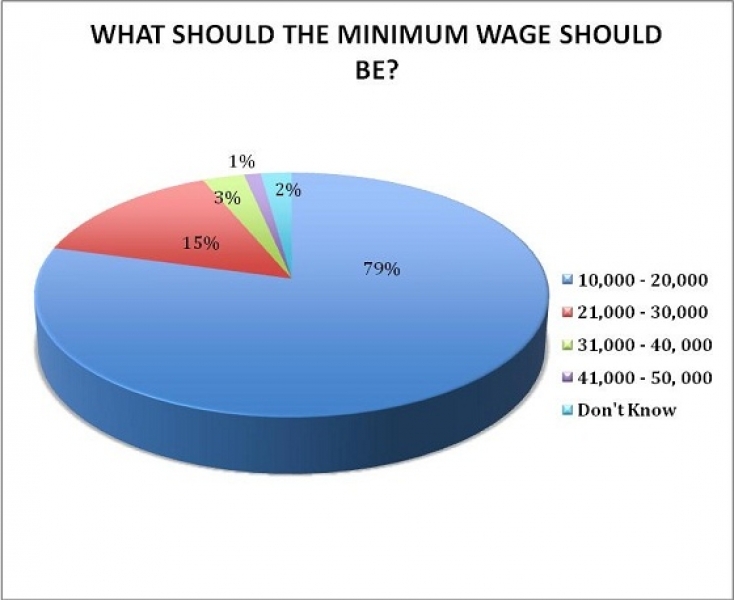 Finally, respondents were asked what they think the minimum wage should be. Almost 8 out of 10 (79%) respondents quizzed stated that the minimum wage should be between NGN10, 000 – 20,000; 15% said between NGN21,000 – 30, 000 while 3% said that the minimum wage should be between 31, 000 – 40, 000. Only 1% of respondents said that the minimum wage should be between NGN41, 000 – 50, 000. Respondents for the snap polls were randomly selected from a database of phone-owning Nigerians aged 18 and above across the six geopolitical zones in the country. 1155 people took part in the telephone interviews conducted from the 3rd and 8th of August, 2011. For a sample of this size, we can say with 95% confidence that the maximum margin of sampling error is ±3 percentage points. This poll is part of the ongoing snap poll exercise conducted by NOI Polls to rapidly assess public sentiments following various social, political or economic events. NOI Polls is a Nigeria based opinion research organization, which works in technical partnership with Gallup Polls (USA), to conduct periodic opinion polls on various socioeconomic issues in Nigeria.